Want to review your gun? – Compressed air or Nitrogen only! – Weight without barrel: 2 lbs. 3 oz. Impressed? I am. And just for the sake of mentioning, the Protégé board comes with all the basics, which comply with the standards of rec ballers, as well as tournament ballers. 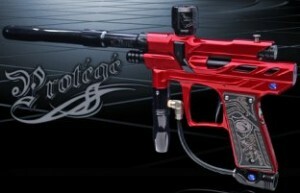 It has Cycle Delay, Debounce, ROF Cap, Semi Auto, PSP Ramping, PSP 3 Shot, NXL Full auto, and dwell settings. Feel free to prove me wrong, but I can’t find a single flaw in this marker. So let’s move to the other good news. The marker will cost you only about $550. I mean, really, what more can you ask for.